Charitable giving is such an important part of the Christmas season that even hardened cynics find themselves suppressing their doubts when sleigh bells are ringing and jingling. But in modern day London, charity is invariably wrapped up in fun activities for all the family which makes Christmas all the more magical. 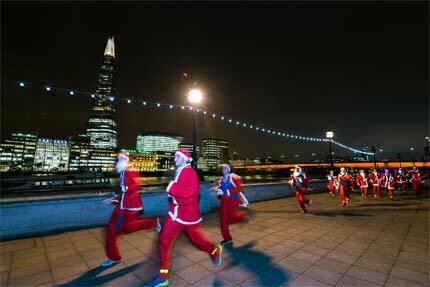 Santa runs, pudding races and the like, all put smiles on our faces as well as much needed money towards worthy causes. The winding cobblestone streets that criss-cross the summit of Hampstead Heath give the area a distinctly Dickensian flavour and this is no more apparent than during the festive season. When Christmas rolls around, the lights from the shop windows combine with that of the wonderful street decorations, making the local Christmas market one of the most picturesque in London. Apart from the shops and pop-up stalls, there will be street jugglers, carol singers and Santa’s Grotto, complete with live reindeer. The kids will love the special Festive Trail which provides hours of fun as it allows them to explore and discover. 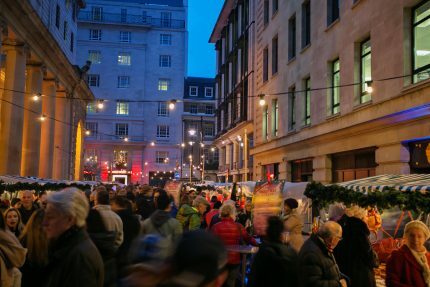 Mince pies, mulled wine and many more yuletide delicacies will be available from a selection of food stalls. Pedestrianising Mayfair Place and decorating it with festive lighting and stalls selling luxury items is a pretty good way to get some of London’s more discerning shoppers into the holiday mood. Hosted by the upscale Novikov, this exclusive market event features a selection of elite traders which include some of the top names from the world of high-end gifts. From caviar to cashmere and from oil paintings to essential oils, this is definitely a Christmas retail experience for the connoisseurs among us. Iberico hams, vintage champagnes and delicious fare from the Novikov kitchen will keep the shoppers well fed and a selection of live bands will keep spirits high. When it comes to cutting-edge fashion, beauty and homeware, SAMPLE Christmas has got you covered. Not only does it give you the opportunity to snap up gifts that are not found on the high street but it is also an invaluable source of ideas and inspiration.Taking place at the beginning of December, the focus is on the quirky and the eclectic and although the main focus is on independent designers, there is space dedicated to other pursuits. 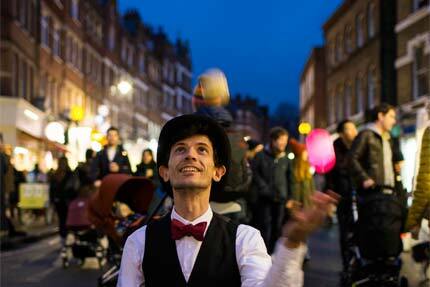 These include a vintage cinema, informal wine tastings, DJ sets and discussions about design and culture. 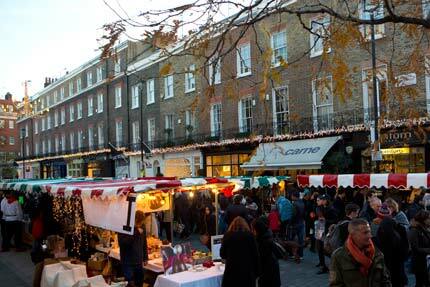 Belgravia follows the recent trend set by other upscale neighbourhoods by hosting its own open-air market with a festive theme. Because the grand houses and imposing squares of SW1 form their own impressive backdrop, there’s no real need for extra decorations and this early December event makes do with just some well-stocked stalls and tasteful decorations. Over sixty boutique stalls will be set up just around the corner from Victoria Station and will feature artisan goods, jewellers and high-end gifts. There’ll be plenty of mulled wine on tap and a live stage with carol singers. 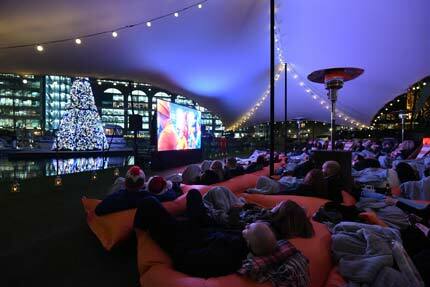 Leave your inner film critic at home when you venture down to the Thames in search of guilty yuletide pleasures. The movies on offer at this riverside floating screen are unabashedly sentimental and cheesy, but they are just the ticket for an evening snuggled up on a cosy beanbag under the stars. The listings are a who’s who of Christmas schlock and include The Holiday, Miracle on 34th Street and Home Alone 1&2 (happily the rubbish Macauley Culkin-less Home Alone 3 is nowhere to be found). Snacks, hot toddies and a fine selection of wines are all available and visitors are kept safe from the elements by a comprehensive canopy and plenty of blankets. There’s something about a Santa outfit that brings a smile to the faces of young and old alike, so what could be better than dressing up in the iconic red suit before raising money for charity and boosting your fitness levels. That’s what the Santa Dash is all about. Entrants pay £25 to enter the 5K race which takes them past all the major landmarks of the square mile. The money raised all goes to Brainwave which helps disabled children unlock their potential which makes this a worthy alternative to after-work drinks. The fee gets you your own Santa suit and a drink at the end of the race. The event is open to all levels of ability and fitness. Each year since the end of the Second World War, the people of Norway have gifted London with a tree as a token of gratitude for helping to rid Europe of tyranny. It takes pride of place near that other great British hero, Lord Nelson and is a wonderful focal point for all manner of seasonal activities. During the weeks leading up to Christmas Day, several choirs will take it in turns to serenade the public with a selection of carols, hymns and festive favourites. 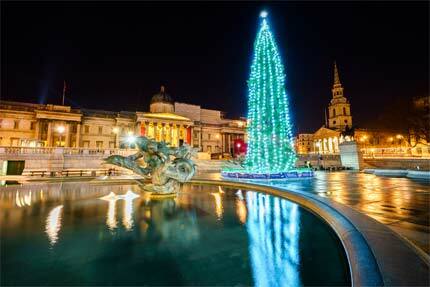 The tree will be spectacularly lit up and there will also be live brass bands playing. Stalls selling Christmas treats like mince pies and mulled wine will help fend off the cold and everybody is invited to join in with the singing. A charity fun run with a difference, this competition involves running around Covent Garden dressed in the most outlandish costumes you can come up with. There are plenty of bizarre obstacles to get over, but the main challenge is the balancing of a Christmas pudding in a tray which you have to get across the finishing line intact and uneaten. 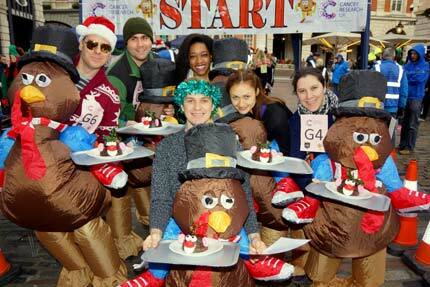 The event is in aid of Cancer Research UK and teams of contestants are welcome as are office outing groups. Entertainment is provided by The Roxys, a vocal jazz group that specialises in reimagined pop covers and soulful harmonies. 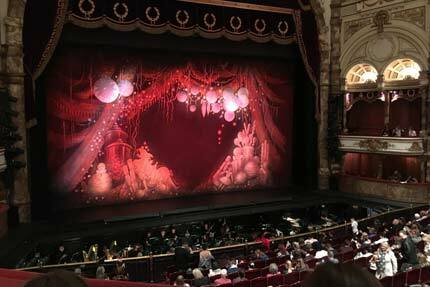 The Nutcracker is a ballet that we cannot resist! Stunning sets, incredible dancing all set to Tchaikovsky’s popular score played live by a fully committed orchestra. This venerable story of toys bursting to life on Christmas Eve is fully realised on the London stage which the English National ballet brings to life so well making it suitable for all ages. Set in Edwardian London, this exquisite ballet centres around the magical adventures of Clara, a young girl who cannot wait for Christmas to arrive. Together with her favourite toys and her Nutcracker doll, she is transported to the Land of Snow, a kingdom of confectionery where she witnesses the iconic dance of the Sugar Plum Fairy. An absolute delight! Christmas carols can be a simple affair – as in kids turning up on your doorstep, looking for sweets after a few choruses of “Silent Night” – or they can be an all-out blockbuster complete with orchestra, choirs and pipe bands. 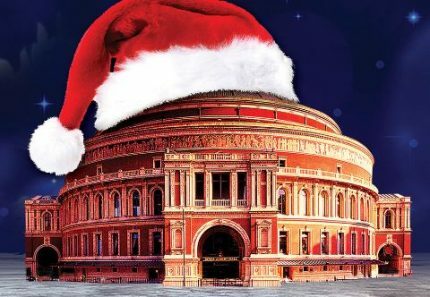 If you want the latter, then head on down to the Royal Albert Hall where the Christmas season is about to hit its stride. 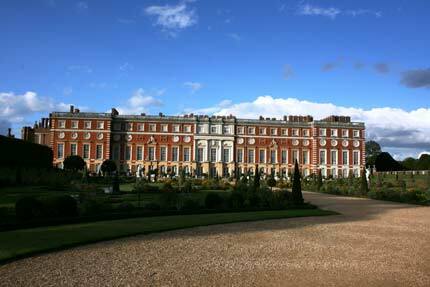 If one where to imagine the ideal setting for a sumptuous festive banquet, then surely the majestic surroundings of Hampton Court would readily spring to mind. Henry VIII was known to celebrate there in some style and today it provides the ideal backdrop for a food festival that promises to be simultaneously traditionally festive and daringly imaginative. Taking place in the palace grounds, the event allows stallholders extra space to really jazz up their stalls with extra decoration and display, which in turn gives the fair a certain old-school vibe. Top chefs Angela Hartnett and Chris Bevin will be sharing their knowledge and opinions which will obviously include tips on how to cook the perfect Christmas dinner: Are Yorkshire puddings allowed or not? Find out here.